When 14-year-old Shawn Peipi gained 20kg in six months, his paediatrician referred him to the Sport Gisborne Tairawhiti GRx Active Families programme with concerns about his weight. A year later he’s fitter, slimmer and more confident than ever. Shawn weighed 98.8kg with a BMI of 35 when he joined the Active Families programme in April 2013. Like many kids, he was a fussy eater who didn’t like fruit and vegetables and preferred eating junk food. Active Families coordinator, Tania Lardelli, met with Shawn and his mum Tracey, and recommended they start taking “baby steps” to improve Shawn’s lifestyle. “The first thing we did was switch our bread from white to brown, which Shawn loves. We also focused on eating a bit less,” Tracey says. Another challenge for Shawn was that he didn’t enjoy physical activity. 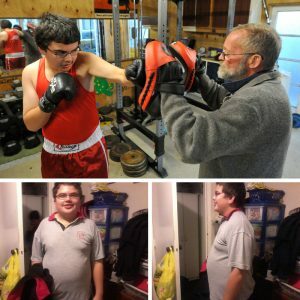 He avoided sports at school and found going to the gym with his dad “a chore”. “I was really apprehensive as I didn’t think he’d like it. But from the first night he’s never looked back,” Tracey says. A year on and Shawn has grown 6.9cm, lost 8.2kg and has a BMI of 29.6. He goes to Boxfit four times a week and, for the first time, is enjoying PE and trying new things at school. “He’s motivated, focused, energetic, and it’s built his confidence up big time. He used to be really shy, now he’s cheeky!” Tracey says. And it’s not only Shawn who has benefitted from the Active Families programme. Everyone in the Peipi household now does some form of exercise and they attend monthly nutritional workshops to continue making improvements to their diet. Tania says it’s this kind of family support that makes all the difference to her clients.